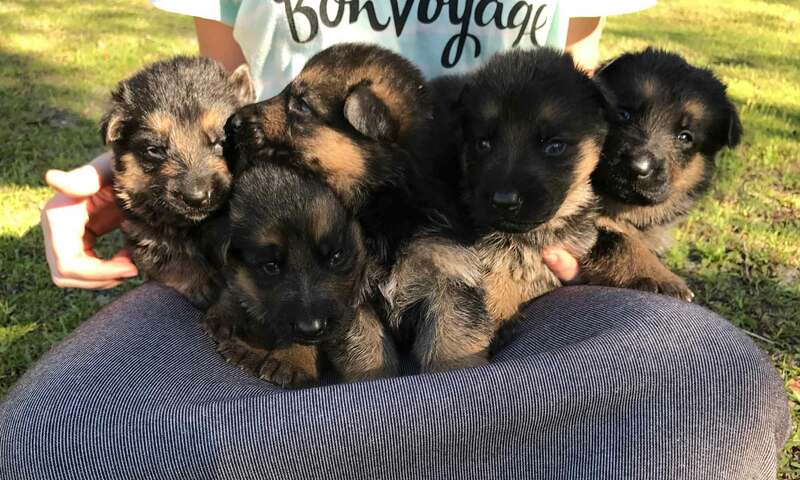 How do we pick our new German Shepherd puppy? Do we leave a deposit before choosing? When can we visit the litter!? We know you want to see the puppies and play with them and we understand you want to know what you are leaving a deposit on. This is how it works here. In the best interest of the mom and puppies we never allow visitors to come over at the end of the mom’s pregnancy nor right after the litter is born. Visitors are allowed only once the puppies are 5-6 weeks old. Why? Because the mom can become stressed with visitors and we don’t want that! She might step on the puppies from excitement and we certainly don’t want that either. The puppies have different stages they go through and are not yet ready to meet strangers until at least 5 weeks of age. There are many germs that can be brought here and in the best interest of the puppies we just have to be careful. The puppies do nothing but nurse and sleep for over 2 weeks. Before they can even see at 3 wks the eyes are open and they are trying to wobble around. By 4 weeks they are up and around – playing- starting to explore – and eating canned food. We as the owners talk to them, sing to them (thats Emma’s job) pet them, and let them climb on us. We are careful not to pick them up too early as we don’t want to scare them. We do all this to make a happy and confident puppy for YOU and your family. At approximately 5 weeks we allow strangers to view the puppies playing in their own environment. We will post litters on our website as they are born. At 8 weeks old and after, the vet has examined the puppies and given vaccinations and issued health certificates. Only then are the puppies allowed to leave here and go to their new home.